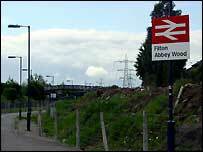 Engineering works to modernise Filton Abbey Wood Station and the rail line running through it have been completed on time. The station, near Bristol, and the main rail line running through it have been closed for two weeks, while the work was carried out. A thrid platform has been built at the station and a third track has been laid to reduce bottlenecks in the area. The £16m project was funded by Network Rail and the Strategic Rail Authority.